For an unknown number, what text should I put to make it clear that data is missing? I have a number that takes in the user inputed start time of a task, and the user inputed end time of a task, and uses that to calculate how long a task took. Say, a user schedules a task, but doesn't enter their start time, but enters their end time. In this case I would later prompt the user when reviewing to enter a start time. 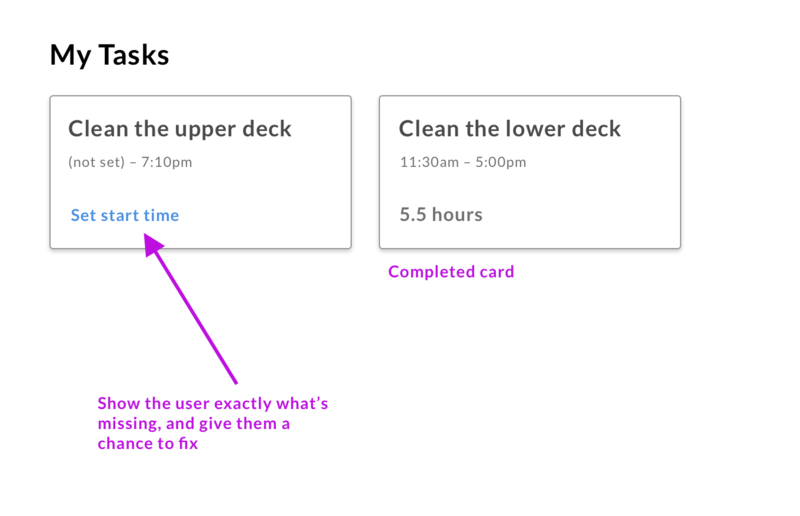 However I have a card that shows tasks, and some of the default data in that card are items such as how long a task took, and the start-time and end-time. How would I go about showing these missing numbers to users? I've toyed with "N/A" and "?" and even showing the actual amount of time (in this case "0"). Give the user an indication of exactly what's missing, and a chance to fix in close proximity. You don't have a mock, so I took a shot at a card with info that might be relevant. I used the phrase 'not set' when displaying the hours, and a link to fix where the total hours would normally be displayed (see the Completed card to the right). I think it depends on whether your tasks can be modified at a later time? So if it is empty at this time, but sometime in the future, the user has the ability to edit the task numbers, then I don't think it will be a good practice to say 'N/A' which is quite subjective and does not explain the issue to someone who reads the task. You could instead use more understandable placeholder texts such as 'Enter Start Date', or 'Insufficient Data'. You could even use colors to indicate States, for example, if the row is valid then a light green background or if the data is insufficient then you could apply a light grey background. The idea is to not leave someone guessing and assuming, you should be able to make it clear what the issue is. Not the answer you're looking for? Browse other questions tagged usability interaction-design human-interface-guideline or ask your own question. How to report outcomes of a background task to users? How to show that items in a “Filtered” List will contain only a portion of what would be in the unfiltered item? How to design UI where you may enter only one of different values that represent the same quantity?